Additionally, formaldehyde is commonly used as an industrial fungicide, germicide, and disinfectant, and as a preservative in mortuaries and medical laboratories. Formaldehyde also occurs naturally in the environment. It is produced in small amounts by most living organisms as part of normal metabolic processes. The Environment Protection Agency of the USA EPA declares Formaldehyde to be a possible carcinogenic. Nanotechnology is used to treat cotton, polyester, wool, silk and rayon. The fabric is dipped in a solution of "nanowhiskers" - tiny fibers of cotton that are 1/1,000 of the width of a normal cotton fiber. These fibers attach to the fabric and create a cushion of air around it, making it more wrinkle-resistant and causing liquids to bead up and roll off. The key ingredient is a product marketed as 'Nano-Tex Resists Spills.' The treatment repels liquids ranging from coffee and red wine to chocolate syrup and salad dressings while allowing the fabric to breathe. Scholars at the Massachusetts Institute of Technology (MIT) predict that the societal impact of nanotechnology will be greater than the combined influences of the silicon integrated circuit, medical imaging, computer-aided engineering, and man-made in this century. The broad effects will certainly be notable in the fabrics that we wear. Scary! As with a new drug, more studies proving the safety of nanotechnology are necessary before launching into the widespread use of the technique. At Ami Sol safety comes first. Consequently, we have a philosophy of getting back to the basics. We only use natural, healthy fabrics. That’s just the kind of company we are. Our commitment to our customers is to provide a safe product, and therefore we do refuse to use nanotechnology on our fabrics until further studies demonstrate the safety of this technology. Please read our stunning findings about Nanotechnology on sunscreens! Stain Resistant, Wrinkle Free and Permanent Press Fabrics, BE AWARE! Sometimes fabric labels seem too good to be true. Some clothes claim to resist stains and to never, ever need an iron. For moms, it can seem like a dream come true! Kids get so dirty so quickly that it seems like in a heartbeat a beautiful new garment can suddenly be history. However, remember that these “wonder-fabrics” more than likely have either formaldehyde or the very questionable nanotechnology. I would rather deal with stains and wrinkles than buy anything that could harm my children’s or my own health. 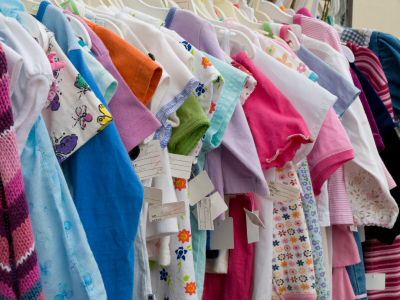 The better choices for us as parents are natural fabrics, including silk, linen, and organic cotton. The organic cotton used by Ami Sol contains some spandex which is approved by the Organic Consumers Association. There is no comparison between our fabrics and those touting “Stain Resistant” and “Wrinkle-Free” labels. 1) Call the manufacturer and ask them what makes their fabrics sun protective. Ask them If there is a chemical added to the fabric, ask about its safeness. Your best choice is to choose a fabric that has the UV protection built in the fabric, such as our Unique Sun Protective Clothing. 2) Buy organic fabrics when possible. We have heard and read about all the great benefits of buying organic food. Those benefits certainly extend to clothing as well. Don’t risk harming your growing children with chemicals.